no wonder it's called a Bottlebrush Plant! A fabulous new colour addition to the amazing Bottlebrush family. Usually red, this is the first widely available Pink, and what a neon pink it is too! Each flowers is made up of thousands of thin petals, each pollen rich, so become a mecca for bees and butterflies early season. Flowering in Spring, it is great to attrratc early season pollinators to fruit - and sometimes has a mini flush of flowers again in Autumn. Supplied as an established plant tall in a 9cm pot. 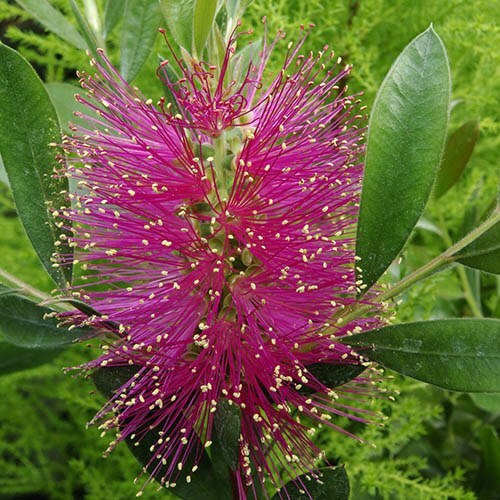 This is a fabulous new colour addition to the amazing Bottlebrush family. No prizes for guessing where they get their name form, their classic Spring flowers zing with intense colour. Usually red, this is the first widely available Pink, and what a neon pink it is too! Each flowers is made up of thousands of thin petals, each pollen rich, so becoming a mecca for bees and butterflies early season. Flowering in Spring, it is great to attrratc early season pollinators to fruit - and sometimes has a mini flush of flowers again in Autumn. Grow in a pot in a warm and sunny spot, in a well-drained mix. Although hardy to -5C or so, we would advise some Winter protection, as early leaves and growth can be damaged.